He places Hannah and Emily at the picnic table with a 1950s thermos and cups and some sandwiches. 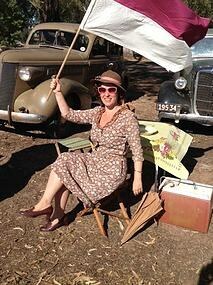 Angela also gets a flag to wave and an ancient fold up stool. Tom gives Meredith and I Dungatar scarves to wear and sits us on the bleachers behind the actors. The camera crew construct their camera and measure things and change lenses and discuss angles and the actors arrive and sit in front of Meredith and I. Alvin and Muriel Pratt, Gertrude, Evan Pettyman, Beula Harridene… The man with the clapper board takes his place, closes it gently and the Dungatar Demons play footy. We barrack, Jocelyn calls ‘cut.’ Meredith and I watch the crew surround the actors, open umbrellas against the sun and offer drinks and insect repellent. The hairdressers primp and the makeup artists dab and the costume people tug at hems and collars. Kate Winslet, dressed in startling red couture, walks defiantly across the Jung footy oval in stilettos, composed though her heels are sinking. Her complexion is very English in the Dungatar glare and the Australian bush-green. Behind her, Judy Davis, small and magnetic, watches. Before her, Sergeant Farrat waits. The actors go, Emily dozes under the bleachers, we visit the refreshment shed. The sun rises, the fly population increases and the sandwiches go hard.